Dentist Hooksett: Brushing, Flossing, and Rinsing, Oh My! We all have been told the importance of good oral health and how to achieve it. Regular checkups and cleanings. We know that brushing and flossing are key components to a healthy smile. Making regular dentist appointment can help keep your smile fresh, but good oral hygiene starts at home, the dentist can only do so much that will only last so long. You have been told that flossing can greatly improve your oral hygiene. You know the importance of brushing twice a day, everyday. And you have heard that mouthwash can do more than just freshen your breath. But how do each of these actually help you maintain good oral hygiene? In this blog we will go through the purpose of each step in the good oral health process. At Granite Family Dentistry, we know the importance of keeping a good routine when it comes to your teeth. 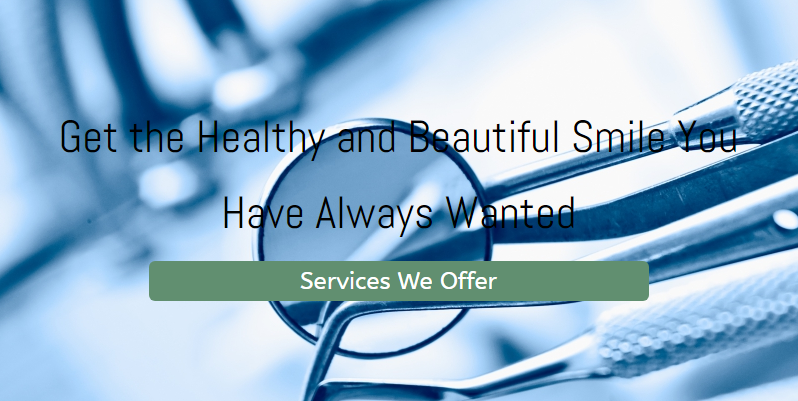 Ensuring that you get the best home care for your smile, we offer home care advice, telling you how to best brush, rinse, and floss your teeth. But now let’s go over how each of these processes actually help and affect the health of your teeth. We all have been told that brushing our teeth is important. Brushing your teeth helps remove plaque from your mouth. This plaque can cause disease, bad breath, tooth decay, and other health problems that you never knew could occur from your teeth. If that isn’t reason enough to brush your teeth regularly, then we will just dive into the details. Gingivitis, which is the first stage of periodontal disease, can be more easily prevented by brushing regularly. Gingivitis is caused by the buildup of plaque around the teeth. At the most advanced stage, periodontitis can cause your teeth to become loose or even fall out. Who knew a little plaque could become such a big problem? Plaque is a normal thing to find in your mouth, but too much plaque is not a good thing. It can lead to gum disease, bad breath, and other health issues. But brushing can help your teeth look healthier too. The toothpaste you use could help remove stains, giving your teeth a cleaner, whiter, and healthier look. But as for your overall health, brushing can help with a few different things. According to Bow Lane Dental Group, brushing your teeth can both reduce your risk of heart attack or stroke, help prevent dementia, and even help with your baby’s health. Bacteria in your mouth can work its way into your bloodstream which increases your chances of having a heart attack or a stroke. By brushing your teeth, you are reducing the amount of bacteria in your mouth, which means you are lessening your risk of heart attack. That is one good reason to brush your teeth regularly. The Bow Lane Dental Group also mentions the fact that the risks of developing dementia increase by a third with poor oral health. They state that gum disease can contribute to the progression of diabetes, but this is also a two-way street. People with diabetes have a tougher time preventing serious gum disease. As for your baby, brushing your teeth and maintaining good oral hygiene can decrease the chances of having a premature baby or low birth weight. Gum disease can not only affect your health, but also your baby’s. That is just one more good reason to keep a healthy mouth and brush regularly. We have all had a dentist ask if we flossed our teeth regularly, and we have all lied. But dentists can tell when you don’t floss, because flossing makes a bigger difference than you think. Once again, the main reason for flossing is to remove plaque. According to WebMD, flossing does about 40 percent of the work to remove bacteria and plaque. The purpose of flossing is to clean the sides of the tooth that a toothbrush can’t reach. Your tooth has five surfaces. Your toothbrush reaches the front, top, and back, but what about the sides? You may think that bristles can get in between your teeth, but that is not the case. And that is why flossing is important. Flossing helps remove leftover food, plaque, and bacteria from in between your teeth. Flossing, since is does 40 percent of the work, can have the same health effects as brushing your teeth. Heart attacks, stroke, diabetes, and other health problems can be prevented or decreased with the prevention of gum disease. And gum disease is decreased by brushing and flossing regularly. Flossing also helps pregnant women reduce the chances of premature or low-weight birth. 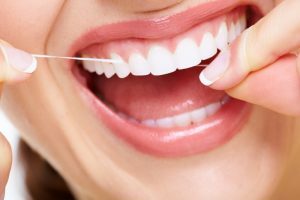 If you think flossing if causing more harm than good because your gums bleed when flossing, well you are simply wrong. Bleeding means that your gums are inflamed and need to be cleaned out, flossing regularly will help clean these areas and cause less bleeding. If you are still bleeding, you may want to talk to your dentist, this is a sign of periodontal disease. Mouthwash does more than just freshen your breath, but this is the main reason many people use it. Bad breath can affect a lot in your life and mouthwash can definitely help reduce the problem. But mouthwash does more than just that. If you are rinsing with fluoride rinse, you reduce the risk of getting cavities. You can fight gum disease by using mouthwashes that contain alcohol or chlorhexidine. And a simple salt water rinse can help with canker sores. 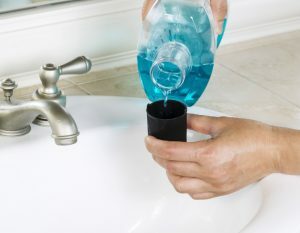 There are many different mouthwashes, with many different ingredients and many different purposes. If you have dry mouth an alcohol free mouthwash may be a good choice. If you just want fresh smelling breath, your favorite flavor will do. If you want to learn more about mouthwashes, which one you should use, and which would best improve the health of your mouth, talk to your dentist. They can recommend mouthwash that will help you with your specific problems. Mouthwash, like flossing and brushing, gets rid of any excess plaque, which helps prevent gum disease and in turn, helps with many other health issues. Brushing, flossing, and rinsing is the ultimate teeth cleaning routine. Getting every last bit of excess plaque out of your mouth. Adopting the routine of brushing, flossing, and rinsing you could greatly improve your oral health, your overall health, and even your baby’s health. Think about that the next time you think about skipping out on the floss or going to bed without brushing. You can learn more about oral health and schedule your next appointment at Granite Family Dentistry. Contact us today with any questions you may have.